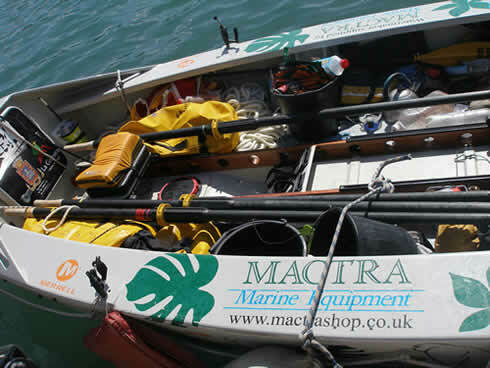 Mactra Marine Equipment have been helping and supporting ocean rowers and racers since 2007. 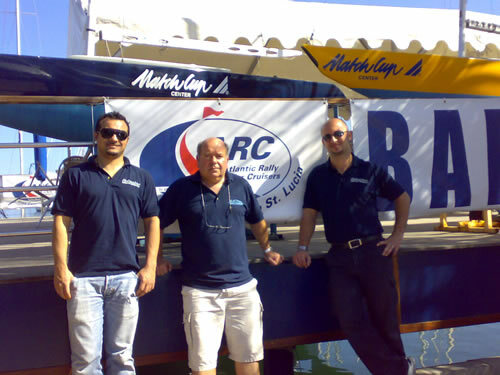 Mactra Marine are keen to support Ocean Rowers and Sailors. "If you must go and row an ocean, these are the names you need to be equipped with, along with 100% back up from Mactra Marine Equipment"
Since 2005 Mactra Marine Equipment have been corporate members of World Cruising Club, the organisers of the Atlantic Rally for Cruisers. 240 Boats leave Las Palmas every November for St Lucia in the Caribbean. With the help of manufacturers Schenker watermakers, for whom Mactra are UK exclusive distributor, Jim and Ann MacDonald and Schenker technicians have been on hand at every ARC Start since 2005 to make sure that the watermakers are all in full working order before the participants leave for St lucia. The Start of the ARC 2007. Left and Right: Schenker engineers Francesco and Pepe. Centre: Jim Macdonald. With many watermaker sponsorships of independent ocean rowers and round the world yacht races now under their belt, Mactra feel confident that they will be able to help future Rowers & Racers with their watermaking requirements. In recent Atlantic Campaigns events Mactra Marine were pleased to have supplied teams with their main watermaker and most others with their hand operated back up watermakers. Click next to read the archive on other ocean rowing and racing sponsorships by Mactra Marine Equipment.